Here we are, back at the blog again as promised. Admittedly, this is a week or so later then I had planned, but… best laid plans and of mice and men and all that. I’ll blame three straight weeks of travelling to visit with partners for the missed target. But all that aside, I am back to share something I’ve been thinking about blogging on for over a year. Namely Azure’s Notification Hub. Notification Hub has bounced around a bit. First it was under the Web Apps banner, then finally landed under the Service Bus brand. Regardless of which area it falls under, I think it’s a highly underappreciated service. Perhaps this will help change that perception in some small way. In short, Notification hub is a way to centralize your notifications across multiple platforms. Its provides you with a single API interface from which you can send notifications to a myriad of platforms (iOS, Android, Kindle, Windows, etc…). In doing this, the service handles negotiations with the platform specific APIs and also helps deal with the various throttling limits that are in place for each. As if this weren’t enough, Event Hub (EH) also provides several higher level functions. Device Registry – a single location that you can use to store details and metadata about individual devices. The service monitor for and purge expired device registrations. Saving you from being kicked off the notification service of various providers. Templates – the capability to define templates that can be used to map a single message to different platforms and notification message formats. Tags – meta-data attributes that can be used to help you target the recipient(s) of a given message. Allowing you to target a single device, a group of devices, or all devices as you see fit. Each of these topics could be grounds for its own post or possibly even a series of posts. But today I’m interested in one specific topic, using NH to send notifications to a Windows 10 UWP (Universal Windows Platform) application written in HTML5/JS. Configure the Notification Hub to talk with the application’s WNS endpoint. Have the app discover its “channel uri” which is used by the Windows Notification Service (WNS) to send notifications to the app. After logging in, click on “Dashboard” then select “Create a new app”. You’ll need to provide a name for your app (that must be unique) so it can be reserved for your use. With the app created we then click on “Services->Push notifications”. The app should already be configured for push notifications by default, but we need to get the credentials so we can configure the Notification Hub. 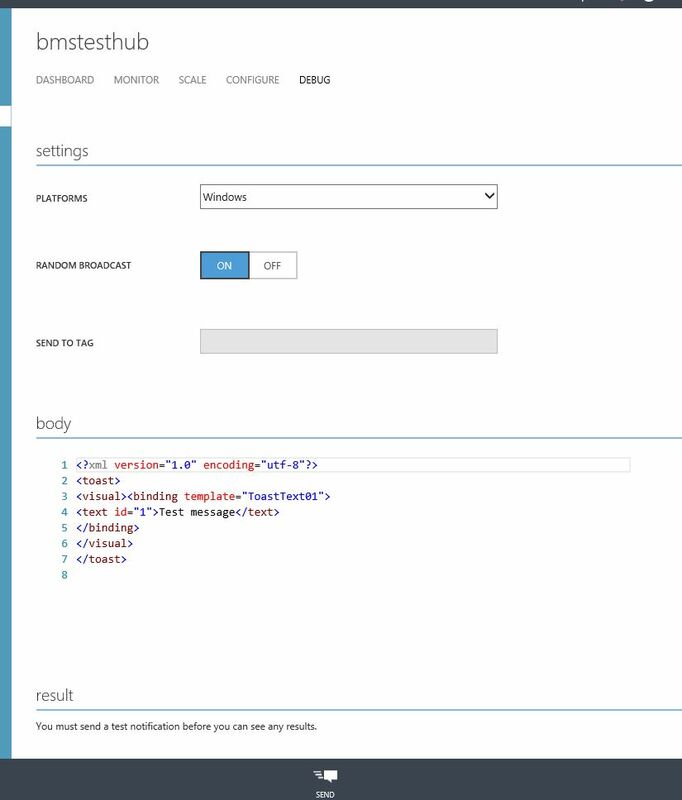 Now we’ll switch over to the Azure Management Portal (classic) and create a new Notification Hub. Select the “+” at the bottom and do App Services -> Service Bus -> Notification Hub -> Quick Create. Provide a hub name, where its located, and a unique namespace for it. After a few minutes (even faster if you’re re-using an existing namespace), the hub will be created and ready for configuration. We’ll click on its “configure” tab and enter in the Package SID and Client Secret from above. Save this change, and switch back to the dashboard for the Notification Hub, and get its connection information for the DefaultFullSharedAccessSignature. This use of the “full” permissions, can be a security issue. But I’ll take more about that in the next section. 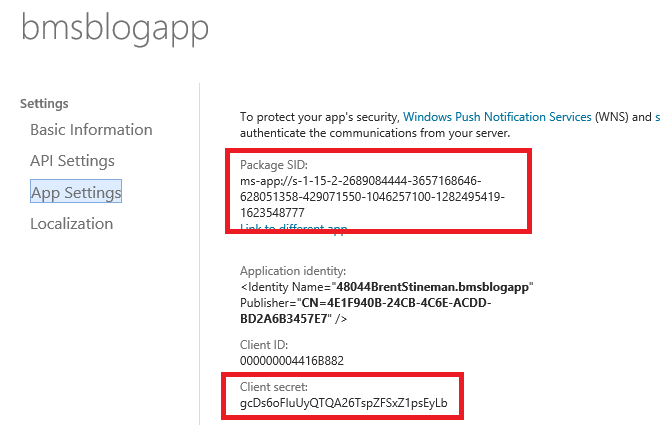 With these steps done, we’ve declared a store application, created a Windows Notification Service endpoint for it, and associated the WNS with our Notification Hub. Its start to start building the app. I want to fix that. To that end I’m creating a GitHub repository where I’ll be putting my explorations in creating UWPs and hopefully others will either fork this effort and perhaps even contribute back to it. I’ll start with what I hope is a fairly solid Notification Hub example. The reason I created two projects was simple, security. I could have let the application directly interact with the Notification Hub api. However, this would have required me to put the shared access key for the hub into the app itself. But by placing it into a server side API, it helps protect the key from being pulled out of the app and put into malicious use. With the solution in place, I started by building an API side first. I’ll create a single API controller that will have two methods. There will be a POST method that accepts a channel URI and returns a Notification Hub Device ID, and a PUT method that takes the Device ID and other values and registers it for notifications. You could put both these into a single operation. But there may be times where you just want to update the registration (say adding/updating a tag). So I prefer this two step process. We start by creating a model that will be used by the controller. This class will be used when the controller is activated to help initialize a Notification Hub client. The class looks like this..
You’ll note that this code depends on two settings. Right-click on the project and add those now. The ConnectionString value we captured when we set up the notification hub. And the hub name we specified when we set up the hub. For this code to compile, we also have to make sure we use nuget to add the Microsoft Azure Notification Hub package to our project and a couple of using clauses so that everything resolves properly. We’ll then add the controller that will contain our Notification Hub registration API. we start by adding a private NotificationHubClient variable and then populate this variable using the model we created earlier. For the post method, I start by define the request object. I create an object that is my request payload, having a single parameter that is the “channel URI”. With this, we can define the POST api method. This method will accept the channel URI (aka handle), and try to find an existing device ID for this URI in the Notification Hub device registry. If we find a match, we’ll return its device ID, and it not, we’ll create a new one. When checking existing devices, we do this in a loop to help make sure we don’t have multiple registrations using the same channel URI (which could result in the app getting the same notification multiple times). Moving on to the PUT method for actually registering the device the app is running on, I again start by declaring my request payload/contract. This one has the device ID from the previous call, the platform we want to register with, the handle (in WNS, this is the Channel URI), and a set of tags that can be used for targeting notifications. Finally, we have the API method itself. It takes the payload, reformats the details into what’s needed for the Notification Hub SDK, and performs the registration. If the device is already registered, this would update/overlay the registration with new values. In this example, we’re taking whatever tags were handed to our API method. In reality, the API may handle this type of update. Perhaps designating specific tags based off of information about the user of the app, or settings the user has defined in the app itself. At this point, you could use a tool like Fiddler to test the API directly. You can monitor the notification hub dashboard in the Azure management portal to make sure operations are succeeding. There’s a bit of delay from when actions show up on the dashboard after being performed (seems like 5-10 minutes for the graph across the top, but an hour or so for the device registration count across the bottom). So don’t expect immediate results if you’re doing this type of testing. I’d suggest just firing off a couple REST requests to ensure your code doesn’t throw any obvious examples and then get back to coding up the rest of the app. First up, we need to look to see if the app was run previously and saved its channel URI. Note the last line, if uncomment it can over-write whatever the saved value was. A channel URI can change and usually won’t last more than 30 days. So the recommendation is that you get it, and save it, and only re-register with the Notification hub if it changes. If you un-comment this line of code, you can run the app over and over again while testing/debugging your code. Just make sure you remove it after you’re done. Next, we’re going to get a new channel URI by using the Windows UWP API. This code sets up a Push Notification client and returns a promise for when the operation is complete, This returns the URI which is then passed to the “then” promise for additional operation. Its inside that promise that the real work is done. We start by checking to see if the channel URI we just received is any different then the one we have saved. If this completes successful, inside of its “then” function, we set up the parameters for the call to the second API, passing it the device/registration ID we received back. Its inside the “then” for this second call that I save the new URI for the next time the app launches. It should also be noted that I’m not really doing any error handling in these samples and that in a production quality app, you really should have a few retries in this (since it will fail if there’s no network connection). Note hose this was inserted before the default.js file. This helps ensure that the object is available to default.js which is the entry point for my application. Inside the default.js we’ll add the code to access our new method. By placing this in the block of the default.js after the “newly launched” I’ll ensure this code is called when the app is launched, but not each time the app is resumed. Which is my intent. Now all that remains is to associate my app with the app I created in the store. 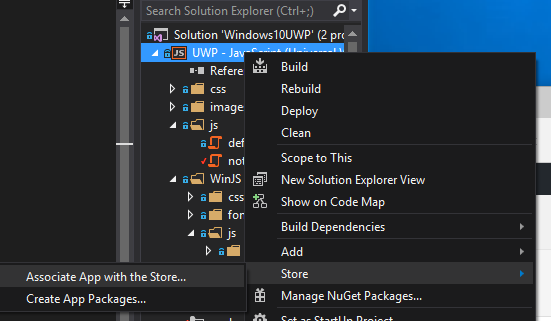 Fortunately, since we’ve already registered our application with the store, visual studio makes this step really easy. Right-click on the UWP application in the solution explorer, and select Store -> Associate App with the Store. You’ll get walked through a wizard that will log you into the store and let you select an existing app, or create a new one. Select the app you created above, and associate it with your app. Note: If you are using a public repository such as GitHub, don’t check in your code after making the association. By associating the project with the store, you are altering the application manifest and adding in a file that contains store specific details. I recommend doing this final stage/testing in a separate branch to allow you to more easily merge back changes without bringing over those details. With this change done, we’re can run the app and test our notifications. Start by first launching the Web API in debug mode. I found it was easiest to set that project to my start-up project. Next, run the UWP application in debug mode. You’ll find you can set breakpoints in both apps and they’ll get hit. Which makes doing basic debugging of the code a lot easier. Once you know the app has launched and appears to have registered with the Notification Hub properly, we can go back to the Windows Management portal and use the notification hub to test our application. Be sure to set the platform to “Windows” and the notification type to “Toast”. If we’ve done everything correctly, you should receive a toast notification. What’s even better, is that if you stop debugging, you can still send the notification. This is one of the things that makes notifications awesome. Your app doesn’t even need to be running for you to still send notifications to it. And with Windows 10, you can even allow the user to take actions on those notifications. But that’s likely a subject left for another day. So hopefully this has helped stitch a few topics together in a way that’s helpful. As I mentioned earlier, I’ve put all this code up on GitHub for you to borrow and reuse if you see fit. Over time I hope to grow that project, so if you want to skip to the parts covered in this blog, just clone the repository, and look for the tag #notificationhubjs.